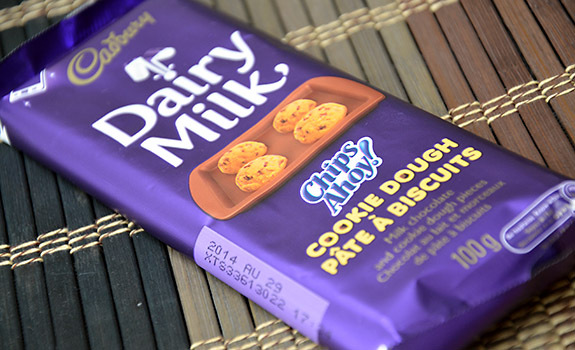 A Dairy Milk Chips Ahoy! Cookie Dough chocolate bar, with the wrapper clearly showing large globs of cookie dough. God bless giant multinational corporations. With Kraft’s 2010 acquisition of beloved British confectionary mainstay Cadbury, which subsequently found itself under the Mondelez International brand, both the Dairy Milk family of chocolate bars and the Chips Ahoy! brand of supermarket cookies fell under the control of the same company. Some blessed soul (who, I’d hope, got a promotion out of the deal) put two and two together, saw the potential for a product mash up, and bestowed upon the world the Dairy Milk Chips Ahoy! Cookie Dough chocolate bar. 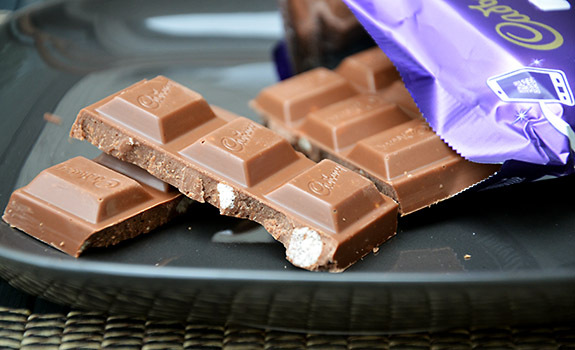 Of all the recent additions to the Dairy Milk line, this is among the most interesting. Something about the pairing makes me feel like a kid again. The Pitch: “Milk chocolate and cookie dough pieces.” Two mega brands become one. The Look: I’m not sure what I was expecting these to look like. The cookie dough lumps on the package illustration made me think I might be getting something akin to a Caramilk bar, but with pillows of cookie dough in place of the caramel. I was quite mistaken. Instead, chunks of cookie dough are dispersed throughout the chocolate, sort of like a reverse chocolate chip cookie. The Taste: Chips Ahoy! are not a premium chocolate chip cookie. They’re the definition of mass produced supermarket cookies, and the taste of the dough used here reflects the taste of the genuine article. You notice things like the light salty notes and dry, floury texture of the cookie dough chunks. It’s not as good as eating a spoonful of homemade cookie dough, but it’s absolutely recognizable as cookie dough. The chocolate, like in most Dairy Milk bars I’ve encountered, is enjoyable even if it’s not fancy. In short, the pairing works. If you’ve ever pinched a lump of cookie dough from a mixing bowl, you’ll see the allure. Once you crack open the package, you can see that the pieces of cookie dough inside are actually quite small. Cost: $2.69 for a 100 gram bar at London Drugs in Calgary. Value for cash money: Just fine. Availability: Not hard to find, but it seems to be out of stock at shops quite frequently. Nutrition? : Per 9 squares (43 grams): 220 calories, 12 grams of fat (7 grams of which are saturated), 30 mg of sodium, 1 gram of fibre, 2 grams of protein. The verdict: Does what it says on the tin. It tastes like small chunks of Chips Ahoy! cookie dough wrapped in a bar of milk chocolate. Even though Chips Ahoy! cookies aren’t spectacular, the dough here tastes right, and the ratio of dough to chocolate is what it should be.